Mom's Gone Bronson! : Cool Down with Unilever Ice Creams: July is Ice Cream Month!! Cool Down with Unilever Ice Creams: July is Ice Cream Month!! Disclaimer: I was provided with ice cream to give my own opinions. I was not otherwise compensated. Your views may differ from mine. July is national ICE CREAM month and Unilever have so many different styles and flavors to choose from that there is something out there to satisfy every taste bud. My kids love to indulge in an ice cream on the porch after a splash in their kid-pool, or while relaxing and watching the world go by. I picked up some waffle cones for pennies and treated them to a delicious Breyer's-filled cone each last night, which they eagerly lapped up and left not a single bite. My oldest son just adores Reese's Peanut Butter EVERYTHING and so the Klondike bars are just what he wanted and my downfall right now are the Double Raspberry Magnum bars, but as I can't include them often in my current eating plan, I know my children are going to be over the moon with those, too! 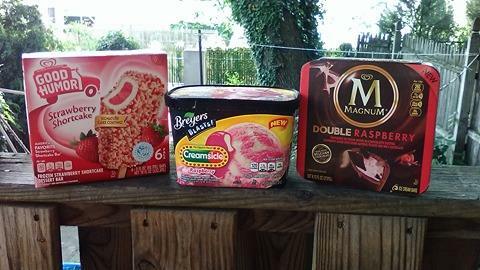 My husband, who is not a big ice cream eater, still adores the Strawberry Shortcake bars and so those I picked up for him, which means that everyone in the house has something they can enjoy at the drp of a hat, while cooling down in this hot summer sun. Did you know that Unilever love their cool treats so much that they actually release 17 NEW flavors this year, which means there are EVEN MORE for you to seek out and enjoy, too. You can find all Unilever brand ice creams in all good grocery stores and bring some home, today - you can also find Good Humor, Magnum, Klondike, Breyer's and Creamsicle (plus aaaaaaaall the other brands in the Unilever range) across social media, far and wide, so seek them out and see what they have in store for your taste buds! I would give a limb for the magnum raspberry about now! This is the yummiest ice cream that I am usually eating all the time when I am looking to have desert. This is the only brand which has been popular all over the world at every single place.